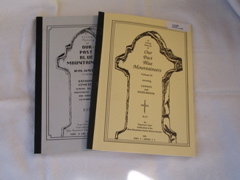 Blue Mountains Family History Society Inc first published cemetery records in 1988, under the name OUR PAST BLUE MOUNTAINEERS, soon abbreviated to OPBM in general speech. For clarity, future updates and reprints are now named "Blue Mountains Cemetery Records" with "Our Past Blue Mountaineers" as a minor heading as our 2 volumes of Wood Coffill (Katoomba) Burial Records make reference to OPBM by Volume number. Volume numbers will not be changed. Cemetery updates are done whenever possible. The cemeteries are in towns along the highway from Springwood to 60km further west at Mt Victoria and then at the isolated settlements at Mt Wilson and Mt Irvine north of the Bells Line of Road. The cemeteries were established before local municipalites and later Blue Mountains Shire were declared. The present Blue Mountains City Council came into existence in 1947 and cemeteries continued under the control of local committees until 1967. As a result there is no definitive list of those buried. Check the Blue Mountains City Council website for their list of the cemetery, section, row and plot number of known graves, including a location map. Also check our cemetery record books. The Council has issued a unique identifying number to each burial, and these are being added to our volumes as each is updated. The first was Volume 6, the Roman Catholic Section of Wentworth Falls cemetery, updated to July 2007. The other 2 volumes of Wentworth Falls were completed early in 2008, followed by the 2 Springwood volumes. Please note that the rows and grave numbers are not clearly marked in all Blue Mountains cemeteries. The Blue Mountains Family History Society is working co-operatively with the staff of Blue Mountains City Council to ensure our cemetery records include cemetery sections recently introduced, as well as row, plot number and identifying number. There are some minor changes in plot numbers from earlier editions, when a certain amount of calculated guessing was necessary. Cemetery Publications are accurate as possible when completed. Unfortunately changes occur due to vandalism, weather, neglect and natural deterioration. Where we have a record of an earlier monumental inscription no longer legible, or missing altogether, the Society will continue to note what was visible years ago. The following is portion of the Introduction to this publication. The Mt York Cemetery, as it was known, was not at Mt. York, but close to the base of the steep descent of the earliest route to the west, namely Lawson's Long Alley 1823-4 in the area called Hartley Vale. At the same time, about one mile (1.5 km) further west, Pierce Collit took up land & established what became known as Collit's Inn. The steep track was treacherous with heavily laden packhorses or wagons often taking a day to make the descent or ascent. Collit was in an ideal location to provide welcome rest and refreshment to travellers. The later Lockyer's Track would have finished closer to the inn, but was abandoned when Victoria Pass was opened in 1832. The earliest burials were on Collit's land, to the rear of the inn. Until recent years the almost 5000 square metre cemetery was on private land. In 1982 the Lithgow Local Government Area listed Mt York cemetery as a heritage area to be under the supervision of the Hartley Vale & Mt. Blaxland Reserve Trust. It is no longer on private land and freely accessible on foot in daylight hours via a laneway from Field Road. According to the Trust's sign at the entrance the first burial was of 8 year old George Pierce Hume in 1832. Even that fact is arguable as the Heritage Council of NSW website states "the earliest gravemarker is dated 1833 (James Watkins)". The sign lists all burials known in 2000 and indicates known locations. Many headstones were the work of James Connor and Charles Goodluck, monumental masons of Bowenfels. Some restoration work was undertaken but deterioration continues. A. Blue Mountains Family History Society: Our Past Blue Mountaineers, Volume 1, 1988, only source with full transcripts including Victorian poetry. C. Lithgow Family History Society cemetery records of 1988. D. Hartley Vale & Mt Blaxland Trust signage 2000. No two lists are identical. The notes have been retained from Volume 1 of Our Past Blue Mountaineers, with some additions. Also reference has been made to New South Wales Registry of Births, Deaths and Marriages and New South Wales National Parks & Wildlife Service local information held at Hartley and Lithgow Family History Society. Weathering, vandalism and general deterioration have taken their toll. The restorative work undertaken since heritage listing has deteriorated significantly in several cases. This publication contains Photographs of the Headstones, transcriptions of each Headstone and family notes. This publication is of a very high quality and essential for each and every researcher of family in the Mount York and Hartley Vale areas. Volume 6 - Wentworth Falls Roman Catholic section is the first updated to include the BMCC's identifying number to link the cemetery transcripts with the Council records. It has been updated to July 2007. Identifying numbers have been added to all volumes of Springwood & Wentworth Falls, Mt Victoria and Mt Irvine. Volumes 1 to 9 are no longer in stock, also all "Old OPBM" Volumes are also out of print and no further copies are available for purchase.. However, we hold copies of all issues and can photocopy as required. Contact bmfhsweb@gmail.com for any further information. The cost of photocopying is $0.25 per page.